(1) This website is for informational purposes only. This website is not intended as a diagnostic tool, professional medical advice regarding diagnosis or treatment, or a substitute for a professional medical diagnosis, opinion or suggested course of treatment by a qualified health care professional, nor is it to be relied upon with regard to diagnosis or treatment. We assume no responsibility for what you do with the information contained on this website. Medical problems, particularly those of a serious nature, should be treated by a doctor in person. Please see your doctor for a professional diagnosis and treatment for any medical conditions you may have. (2) No Claim of Accuracy or Completeness. 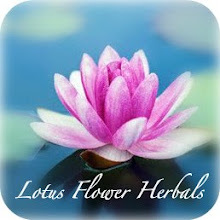 Lotus Flower Herbals makes no promises or warranties regarding the accuracy or completeness of any information contained in this website and/or any pages accessible from this website, nor does Lotus Flower Herbals make any promise or warranty to maintain or update this information. (3) No Warranties of Suitability for Use. Lotus Flower Herbals makes no express or implied warranties regarding the accuracy, currency, completeness or suitability for any purpose of any information contained on this website. (4) Assumption of Risk of Use. Any person using this website assumes the risk of verifying any materials contained herein, as well as the risk of use and/or reliance on such information. Lotus Flower Herbals shall not be liable for any damages for viewing, distributing, copying and/or relying upon these materials, including any indirect, special, incidental or consequential damages, even if advised of the possibility of such damages. (5) No Physician/Patient Relationship or Confidential Relationship. Use by any person of this website does not establish a Physician/Patient relationship or confidential relationship with Lotus Flower Herbals. (6) No Expectation of Privacy. It is expressly understood that there is no reasonable expectation of privacy in your use of this website. (7) Do not send private information to our webmaster. If you need help with a medical condition, please contact your doctor or our office. Lotus Flower Herbals claims no responsibility for or ability to control the transmission of personal information via the Internet. (8) Children's Online Privacy Protection Rule. This website contains no forums, online chats or the like, and no email addresses with the exception of the webmaster email address, which is intended solely for reporting problems with the website to our webmaster. Therefore, no information regarding children is collected. (9) Non-Confidentiality. It is expressly understood and agreed that there is no expectation of privacy or establishment of any confidential or Physician/Patient relationship in the submission of email to our website email address(es). To the extent that any such relationship can be deemed to exist, it is waived. Lotus Flower Herbals reserves the right not to answer any questions submitted by email, for any reason or no reason whatsoever. Again, if you suspect you need medical treatment, please see a qualified health care professional. (10) Links. This website may contain links to other sites. These are provided for your convenience. We have no control over the content of such linked sites, and we make no representations or warranties regarding them and assume no responsibility for their content, nor does inclusion of links to other websites constitute our endorsement of their content. (11) Indemnification/Hold Harmless. You agree to indemnify, defend and hold harmless Lotus Flower Herbals and their officers, directors, employees, agents, information providers and supplies and website designers and maintainers from and against all losses, expenses, damages and costs, including reasonable attorneys fees, resulting from any violation of this agreement. (12) Waiver, Release and Limitation of Liability. You agree that neither Lotus Flower Herbals, nor their officers, directors, agents, information providers or suppliers or website designers and website maintainers shall have any liability to you under any theory of liability or indemnity in connection with your use of this website. You hereby release and forever waive any and all claims you may have against Lotus Flower Herbals, their officers, directors, agents, information providers or suppliers or website designers and maintainers (including but not limited to claims based upon the negligence of Lotus Flower Herbals, their officers, directors, agents, information providers or suppliers or website designers and maintainers) for losses or damages you sustain in connection with your use of this website. (13) Miscellaneous. This agreement shall be governed and construed in accordance with the laws of the State of Michigan, United States of America. (14) No Liability for Website Designer. In the event that this website is designed, updated or maintained by a website designer or web design company, by your use of this website, you agree to hold said website designer(s) or web design company harmless for any responsibility or liability for the information contained on this website or your use thereof, or for any functionality, warranties or promises, or your use thereof, as may in any event be deemed to exist with regard to this website. Confidentiality. We understand that confidentiality of communications is of importance to those requesting information about our services. As a general business practice, we hold these communications in strict confidence. (1) Email. We do not "harvest" email addresses from our website visitors; we do not spam (send unsolicited email to) our customers and website visitors. None of the above personally-identifying information is stored on our website, and thus we provide no online process for individuals to review and request changes to any of their personally identifiable information collected through our website's online forms or sent by email to us. Young Living Essential Oils. When you sign up as a member at a Young Living Essential Oils website for the purpose of purchasing products, Young Living collects your name, address, telephone number, email address, as well as credit card information for the purpose of initiating your Young Living membership, charging for the goods you purchase, and delivering those goods to you. That information is not sold to anyone. (3) Credit Cards. Credit card and related personal information provided to us by our clients is strictly confidential and is used only for the purpose of collecting funds as designated by the client. However, in the event that fraudulent or stolen credit card information is presented to us, we will comply with all applicable laws, law enforcement agencies and concerned financial institutions as required. (4) Web Hosting. Our web hosting company collects and stores only the following information about our website visitors: the numerical IP address or domain name from which they access the Internet; the date and time our site is accessed; the pages you visited and whether they successfully downloaded to your browser; and sometimes the Internet address of the website from which you may have accessed our website (such as AltaVista.com). We use this information only to understand how many visitors we get and how visitors use our website so that we can improve our website. We do not sell this information to anyone for any reason. (6) Surveys. Responses to any website surveys or feedback forms which we may post from time to time on this website are provided to us by our visitors for our benefit, and are likewise not sold to any third party for any reason. Surfing our website will not impart other personally-identifying information to us, unless you choose to provide such information to us.